How Long Does it Take to Get Results from Content Marketing? 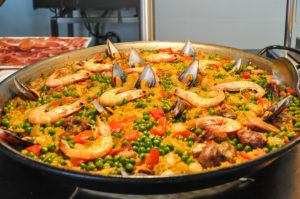 How the chef prepares, combines and cooks quality, fresh ingredients determines how delicious a seafood paella will be. If she wants to serve up a mouth-watering dish, she’ll also sample her cooking during preparation to make sure she blends the ingredients to perfection. What does this have to do with how long it takes for content marketing to create leads and demand? Content marketing is like cooking. Your results will vary based on the quality of your content marketing ingredients and how you combine them. You have to measure your results as you go and adjust as necessary to maximize your marketing return on investment. But whatever you do, you won’t get immediate results. That said, there are some generally accepted guidelines to help you assess if you’re on the right track. The first year, watch metrics for web traffic, the number of backlinks and sharing on social platforms to see if you’re on track. If these are increasing, your content must be resonating with those who discover it. 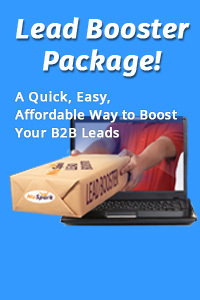 You will also start to generate leads, but don’t expect them to rush in. You’re building buzz and increasing awareness. Be patient. The ripples of awareness start to transform into waves of results. As web traffic continues to climb, your website should ascend in the search engine rankings to page one for some of your targeted keyword phrases. In year two, conversions will likely also increase — contacts, marketing qualified leads and sales qualified leads. 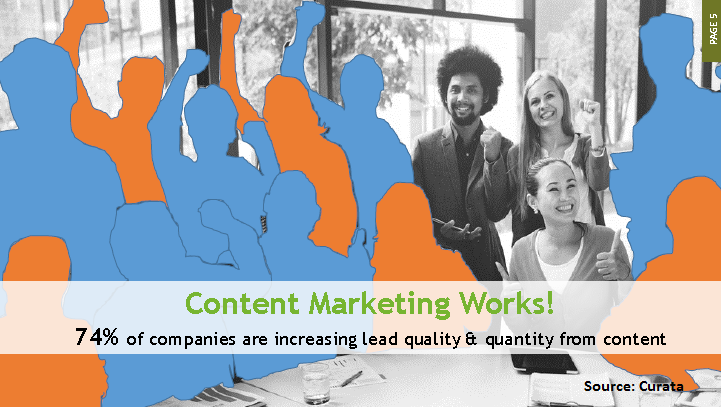 In fact, according to research conducted by Curata, 74.2% of companies indicate that content marketing is increasing their marketing teams’ lead quality and quantity. So, there’s your rough guideline of what to expect. Now let’s dig a little deeper into three factors that affect results. Gone are the days of the content mills when “writers” churned out rapidly written, bland and grammatically deficient blog posts, web pages and more. Served up with an overdose of keywords, such content used to entice Google’s spiders to crawl web pages and place them higher in the search engine rankings. Now, however, Google is smarter. Their algorithms have changed to encompass the value of visitor engagement. Whether you’re trying to boost your rankings or generate leads or demand, quality content is now the name of the game. It starts with an understanding and helping your audience to solve their problems. But you can’t create the same old stuff they read or view everywhere else on the web. You need to find a captivating angle. Or wrap a business problem in a story. Have a viewpoint and be a little controversial. Be passionate about your message. There are many different content formats, but the foundations for most content strategies are blog posts. So, it’s worth understanding that there are different types of blog posts. HubSpot discovered that 10% of all posts draw 38% of the traffic. They called them compounding posts. Like interest on a savings account, their value grows over time. 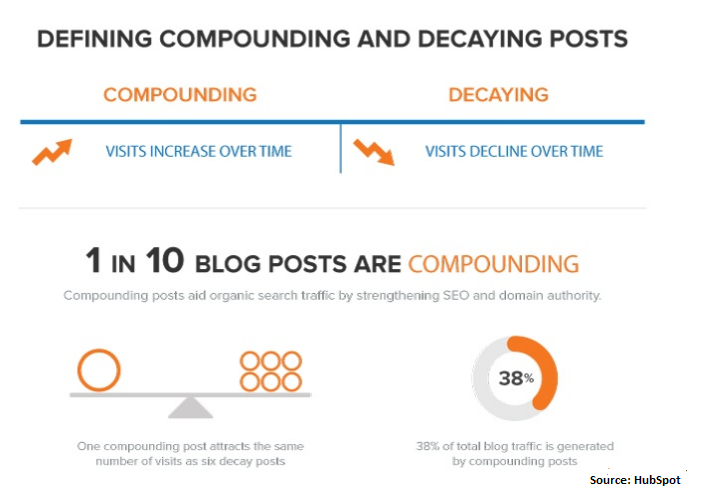 Clearly, if you focus on creating compounding posts, you’ll build traffic more rapidly than if your posts produce a flurry of activity and then die off. Compounding posts are highly tactical and evergreen. That means they’re as useful six months from now as they are today. If no one sees your content, it does you no good. You cannot expect Google to do all the hard work for you. In fact, Google is unlikely to help you unless you first prove your content is popular. This is why both social media and paid advertising are essential. Let’s get social. For B2B marketers, LinkedIn is the star for content distribution. Other popular channels are Twitter, Facebook and YouTube. Use these channels as much as possible to get the most out of free distribution. But content distribution is not always free. 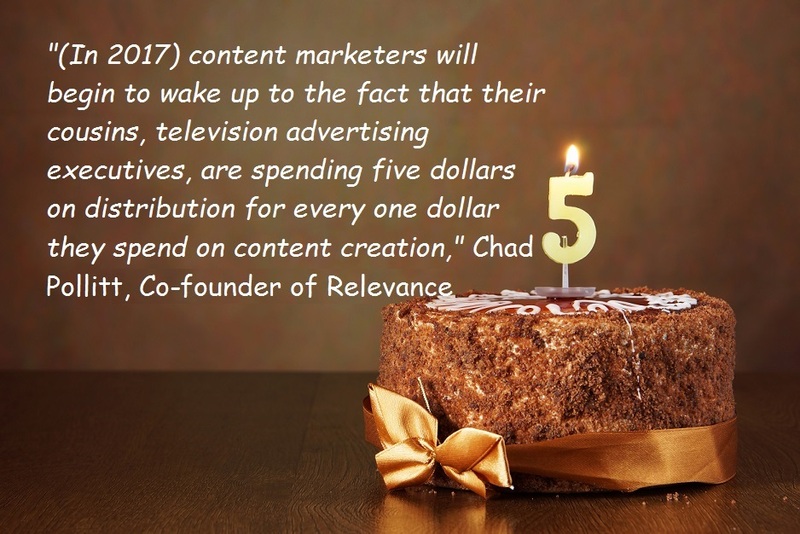 As Chad Pollitt points out, marketers using traditional television media spend five times as much on content distribution as they do on creation. Why should it be that much different in the digital world? There is a cornucopia of options for promoting content online: search engine marketing (SEM), promoted posts on social media platforms, content syndication, social ads, native advertising and online display ads. Try out different content amplification methods and review the results to see what works best for you. By advertising online through the right vehicles, you can significantly accelerate your content marketing success. 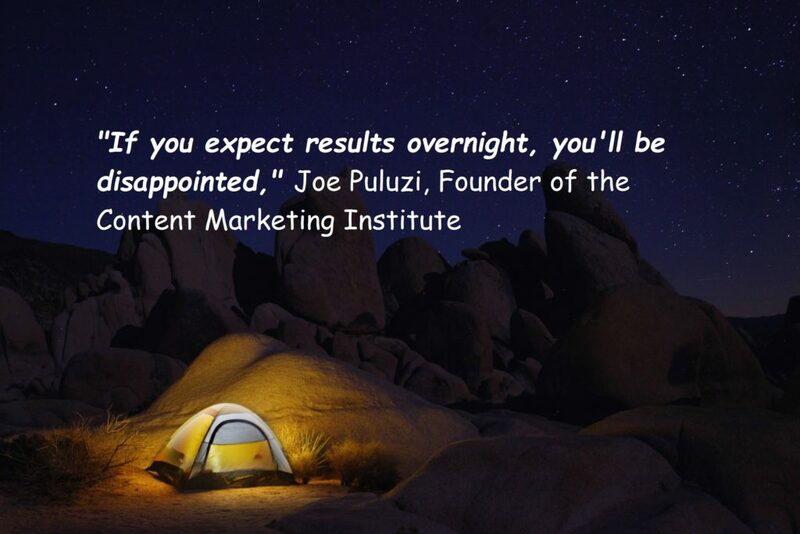 So, there’s no hard and fast answer to the question of when you’ll get results from content marketing. These guidelines, however, should help you understand that you can’t expect an immediate flood of leads and what to look for to ensure you’re building momentum. If you include the right ingredients, and taste them as you go to ensure the flavors are blending perfectly, that energy will grow over time, generating leads and demand. Ready to get started? Find out how NuSpark Marketing can help with your content strategy and content creation.